Student Club Hosts Model U.N.
A student from Greene County High School participates in the Clinton Administration Crisis Committee. 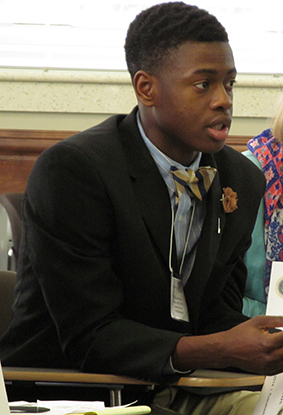 From the March 2014 Desktop News | With the help of UA students, some 125 high school students got a glimpse of global politics in the United Nations when they came to campus to participate in the sixth annual Alabama Model United Nations Conference, one of the largest conferences of its kind in the Southeast. The Alabama International Relations Club, an academic organization comprised of undergraduate and graduate students interested in global issues, hosted the high school students from Alabama, Georgia and Tennessee Feb. 21-23. They participated in debates as they played parts of U.N.-member nation representatives. Club members will also travel to Brussels, Belgium, for Harvard University’s World Model United Nations conference mid-March. Katherine Kelley, a senior majoring in international relations and the club’s president, said organizing the Model UN Conference at UA is a yearlong process of contacting interested high schools, assigning countries and committees to teams, and facilitating research among the committees by providing background information about each country’s key issues. Two UA students serve on each committee as the chairperson and co-chairperson, while other club members work behind the scenes to keep the conference running smoothly and throw curveballs, or new developments, at the committees every hour, Kelley said. The club also helps train high schools to prepare them for participating in the conference. Kelley said some students couldn’t locate their assigned countries on a map before beginning training. “It’s really cool to see that process and to be able to say that we taught them something,” she said. This year’s conference also included a “Hunger Games” component, in which students represented the 12 “districts” as depicted in the young-adult novel and feature film. The organizers also staged a “Clinton 1997 National Security Council,” in which students played U.S. Cabinet members during the Clinton administration. Alabama International Relations Club members travel in small groups to about six Model United Nations conferences each year, where they compete against other collegiate teams in speech, debate, research, writing and other topics. For more information, visit www.alabamairc.com.